As we all feel keenly right now, ECF is in a season of critical decision making. How do we decide on a new associate pastor? What kind of processes do we need to implement and how do we make up our minds? These are big, necessary and important questions. What I would like to do this morning is spend some time on the root topic of Christian decision making in its basics for each one of us; and then try to apply some of those things to our current circumstances. I am truly hoping this will relieve anxiety for some who have struggled in this area in their Christian walk, as well giving us some solid direction as we move ahead in our corporate decisions. I will tell you that at one time in my own life, I knew what it was to suffer from a high degree of decision paralysis brought on by a number of factors some of you may identify with as well. I seriously wanted to make Godly, Christ honoring decisions, and feared somehow missing what some call “God’s perfect will”. The idea that God has one best choice for you in everything in life – from THE person God has chosen for you to marry to THE absolute profession you should undertake to whether or not you should read a certain passage of Scripture that day – or in our case, how do we know THE guy God has for ECF? As we press ahead today, I think you’ll find that being caught in that web is not only frustrating and paralyzing, it is also almost wholly unnecessary. 2. I also feared making mistakes. Not just the idea of missing God’s perfect choice. Hidden in that thought is the idea that if I pick what God really wants, that will mean things will go smoothly, successfully and I’ll have perfect peace about it. When none of that is guaranteed in God’s Word. Remember, all of the Apostles were perfectly in God’s will and suffered rejection, persecution and apart from John – all suffered martyrdom. Things did NOT go well. As a matter of fact, Paul’s detractors traded on that very idea – if he was really God’s man, would he really suffer as much as he did? YES! Mistakes can and will be made. All under the watchful eye of our sovereign and loving God. And not every mistake is somehow sin or even displeasing to Him. But if I look for signs and omens and stuff like that, I can soothe my conscience that I did what God showed me, and if it blows up – best case, I can blame Him! Worst case? I begin to doubt Him for not bringing about what I thought or felt sure He told me. Then what do I do? Well then – what SHOULD we be doing? Fortunately, God’s Word is replete with counsel, so we don’t need to walk in the dark. Making the need for a decision made known to God in prayer is just part and parcel of the Believer’s everyday life. We lay out matters before Him, asking for His wisdom, for clarity in reasoning and trusting Him in it. We’ll come back to this before we are done. But one thing is sure, this is where the Christian begins – on all matters except where I already know the will of God as clearly expressed in His Word. In truth, there are some things we never need to pray about. I never need to ask God if I should cheat on my wife, beat my kids, steal, blaspheme His name, get drunk, slander anyone or murder my neighbor. Nor do I need to pray about the ridiculous. I do not need to ask Him if I should grab onto a high voltage wire, drink bleach, spend more than I earn, try to create a new primary color, live without oxygen, break my own leg just to see what it feels like or convert to Ba’haism. Both of these make a mockery of prayer. But in making true decisions, prayer must be our starting and ending point. We are to be occupied with what God HAS revealed, not what He has NOT. 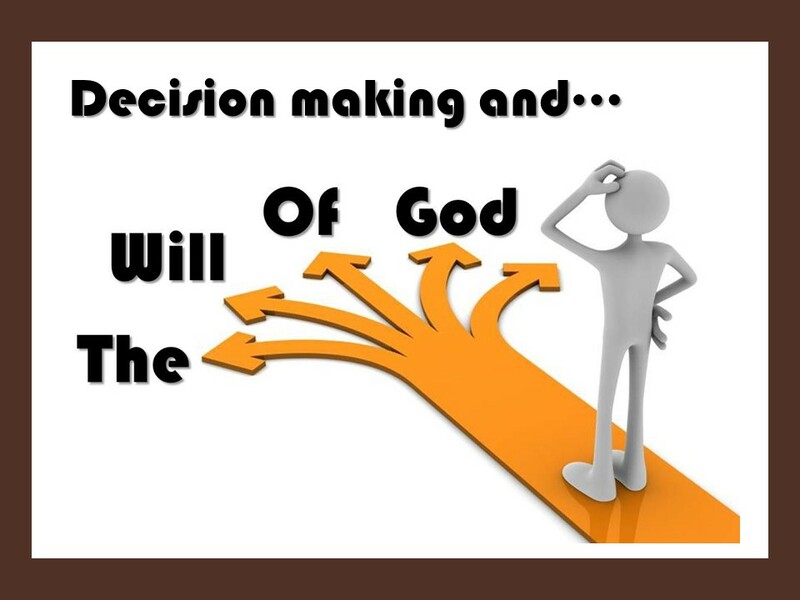 Christian decision making is NOT an exercise in trying to discern the things God has kept from us – but being occupied with what He HAS revealed. So many Believers are paralyzed from making decisions at all, because – in an honest desire to serve God well – think they need to detect some supernatural leading above and beyond the Scriptures. Christians are remarkably free to make all kinds of decisions, even very difficult ones, if we will ask a few clarifying questions. Questions we’ll get to before we’re done. But for now, we need to realize that our first concern is making sure we know what God HAS said, and keeping in line with that – rather than trying to figure out if God is sending out coded or secret messages of some sort that we have to be spiritual enough to detect and then act on. Am I preoccupied over something which is not a matter of plain revelation in His Word? The Holy Spirit illumines FIRST and foremost through His WORD. Am I acting according to Biblical teaching and principles? Have I taken the time to find out what those are? Leave IMPULSES to things that are INDIFFERENT. That is the subject for another sermon another time. The Holy Spirit DOES at times prompt us in certain things – but that is not how we make our basic decisions. As we read in Acts and 1 Cor., all “direct” influence of the Spirit is subordinate to His Word. FLEECES (a major topic for another sermon) – for Gideon is not commended for using the “fleece” method, it was in fact a sign of his own unbelief, cowardice and God’s patience with him – not an endorsement) OMENS, SIGNS, and CHILLS are not our guide. So too, coincidences are not necessarily divine communication. Just because you suddenly run into an old flame on Facebook does not indicate it is God’s will for you to run off with him or her. EXAMPLE: HP – Church choice. JV – John Piper pic. Do not automatically assume a sense of PEACE means all is well, or that a sense of AGITATION means all is ill.
Jesus agonized in the Garden. He was NOT at peace. And on the flip side, the angelic appearances in the Bible all had to be accompanied by “fear not”. Agitation was not an indication all was ill.
III. PRUDENCE: The Holy Spirit leads 3rdly through WISDOM. Foolishness the Bible tells us is sin. Am I using the spiritual gift of gray matter? It is in my estimation the most under utilized gift God gives His people. In the portion we had read in Acts 15, the apostles were confronted with a huge issue: Do gentile believers have to follow the Mosaic law in order to be saved? The debate threatened to split the entire Church. So what did they do? They rehearsed Peter’s history in how the Gospel had spread. They listened to how God had worked through Paul and Barnabas with the gentiles. They took their process as the very leading of the Holy Spirit! Do I take to heart the experience of those who have gone before me? The Holy Spirit has provided leading in the COUNSEL and EXPERIENCE of others. Have I talked with others of mature Christian walk & experience? PLANS: I won’t belabor this point. In what we’ve seen so far, we have example after example that these men and women of God made their plans in accordance with what they knew from God’s Word and using their best wisdom – they acted on their plans and committing them to the Lord, were willing to have those plans interrupted or changed as God intervened providentially. PROVIDENCE: The Holy Spirit directs through PROVIDENCE. Providence, the outward circumstances of our lives as arranged by God also play a role. We see this carried out in a very graphic was in Paul’s ministry. PRAYER: We come then full circle back to prayer – and keeping with the Word, taking advantage of our best wisdom, making our plans – and then committing them into His hands, knowing that He cares for us and knows our desire to serve Him well – We trust Him with our decisions. VII. PROCESS: This then brings us to the practical process. How do we do this? And I have some suggestions which grow out of what we have just studied. QUESTIONS – Asking ourselves the right questions. This may be as shocking to you for its simplicity as it is for its freedom. Will my choice prevent or hinder me from doing anything God expressly commands me to do in His Word? Will my choice cause me to do anything God expressly forbids me from doing in His Word? Have I weighed to pros and cons, and am thus using my best wisdom and counsel? Father, if this is not the best choice, please intervene providentially. What would that look like in our present case? Hiring an associate will not prevent us from doing anything commanded in God’s Word. In fact, it will facilitate it. Hiring an associate will not violate any prohibition in God’s Word. Our collective wisdom sees the need. We make our plans and commit it to Him. Making sure our candidates are those who meet the Biblical qualifications. Committee, Elders, Congregation. Examining them as best we can within our providential constraints. Discussing it all among ourselves so as to make the best use of our collective wisdom. And here is where we need everyone’s candid input. You won’t hurt anyone’s feelings. We need to know what our various and many eyes saw, ears heard and hearts and minds thought. Especially email us so thoughts, observations, opinions and ideas aren’t lost, but all factored in. Does this candidate best fill the specific needs of this congregation at this juncture in our history? Making our choice – putting our plans into motion. Committing all of this into the hands of our Father – trusting Him in it. In the case of Matt Gibert, we followed the process and God in the end answered and interrupted. Not necessarily because he was a bad choice, but for His own reasons. We can trust Him. And we can follow the same process now. We are not required to hire either of the ones before us at present. But all things considered, we may well hire either one – or continue looking. All in prayer, and all looking to our loving, faithful Father to see us through. We don’t have to discern THE guy. We do as Scriptures calls us to, and we will get a guy – in God’s good grace. Who is best for us in this place at this time under these circumstances. We can trust the Father.